What city boasts more breweries per capita than any other in the U.S.? Asheville. That’s why it’s been called “Beer City” since 2009. NPR said Asheville is the “Napa Valley of Beer.” The Country Inn & Suites, Asheville Westgate makes the perfect home base for when you plan to tap into the unique atmosphere and personality of Asheville’s breweries. Our free shuttle can drop you off right in the middle of Asheville’s buzz and within walking distance of dozens of popular, beloved restaurants and breweries. When it’s time to come home, leave the driving to us. After a quick pick-up from our hotel shuttle, you can finish the evening fireside on our veranda. Here are some of our top picks during your stay. You can visit a few, or stay longer and visit them all! For a pub crawl you’re bound to remember, come aboard the pubcycle with as many as 12 of your friends. This pedal-powered, motor-assisted vehicle will carry you through the city streets while you sip any brews you've brought aboard. Request a tour or just enjoy a legendary local favorite like the World Beer Cup Gold Medal-winning Ninja Porter. You can also try fresh-brewed creations as well as delicious pizza at their downtown location. Since 1994, The Bier Garden has been at the center of the Asheville beer scene. It features more than 200 beers from around the globe. Sample a beer or wine while you watch the 16 TVs or the 15-foot screen on game days. Visit Catawba to see its seven-barrel system churn out specialty brews for you to sample at the 30-tap bar. You and your fur-friend can visit this brewery's three-story "Greenmansion" to enjoy mountain views and 19 beers on tap. Sample traditional English styles before taking a tour, available Thursday through Saturday. indoor and outdoor music venues, a variety of brews on tap, and a 45-minute guided tour of their brewery and packaging facility. Hi-Wire's original location in the South Slope area is the place to sample flagship favorites like Hi-Wire lager or Lo-Pitch. If you're in the Biltmore Village, stop by their second location for an equally delicious beverage. Situated alongside the French Broad River, the Liquid Center Tasting Room is an ideal place to sip a tasty beer. 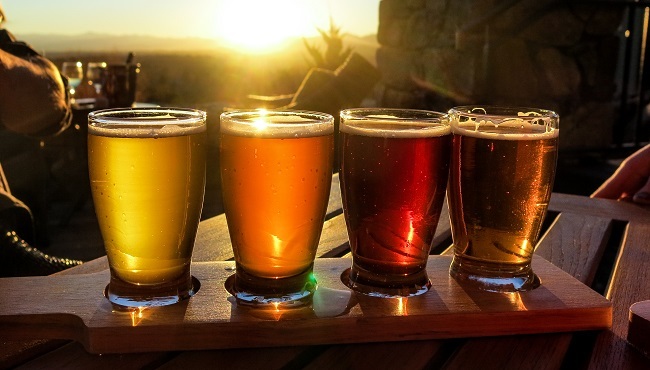 Plan some extra time to take the free, 90-minute brewery tasting tour (reservations required). You’ll want advance reservations for the brewhouse tour and tasting at this East Coast extension of Sierra Nevada. Birthed in Chico, CA, this brewery features a mesmerizing entrance, a mammoth facility, and a beautiful taproom and restaurant with riverfront views. One of downtown Asheville’s most popular breweries, this award-winning spot features a 15-barrel system and specializes in West Coast hoppy ales, open-fermented Belgian beers and barrel-aged sours. Tour the brew space before getting a table at the upstairs restaurant and bar where you can sample one or more of the 20 on-tap beers.